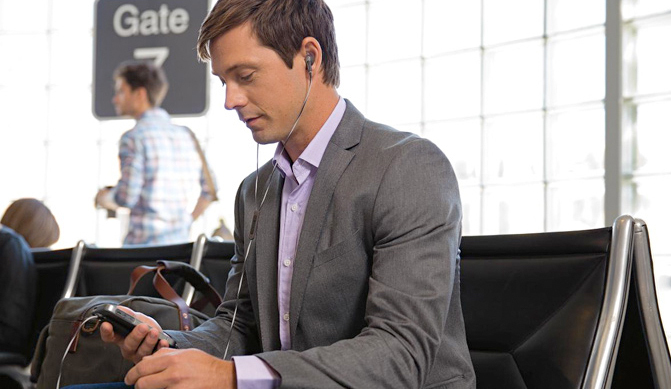 Bose® has long been known as an industry leader for their full-sized noise-cancelling headphones and they now bring their first pair of in-ear noise-cancelling headphones to market. The new QuietComfort 20™ for Android, Blackberry, and Windows-based portable devices and QuietComfort 20i™ for iPhone, iPad, and iPod offer Bose’s trademark Acoustic Noise-Cancelling technology in a compact, in-ear design. The noise-cancelling technology works by making use of tiny microphones that are located on the inside and outside of each earbud. These microphones sense and measure the outside noise in your environment, such as the familiar, unwanted engine sounds that occur during airplane flights or bus rides, for instance. Using digital signal processing, the headphones compare the noise from your surroundings to the volume of the music that you're listening to and then produce an opposite signal to effectively “cancel out” the unwanted noise. Not bad for a pair of earbuds, eh? The QC20 and QC20i also employ an “Aware Mode” feature that allows you to hear more of the sound from the environment around you, while you still enjoy the benefits of noise cancellation. This can be helpful in situations that call for you to remain alert, like when you're biking through a busy city or waiting for your gate to be announced at the airport. So, instead of having to remove your headphones to hear what’s going on in the outside world, Aware Mode can be turned on just by pressing a button. In addition to the signature noise cancelling, Bose has also equipped the headphones with their proprietary TriPort technology, along with an active EQ. So, whether you’re listening to rock, hip-hop or country, these features work in tandem to provide a full and balanced response across the frequency spectrum. Beyond sound quality, Bose has also paid close attention to the fit and comfort of the QC20 and QC20i by including three pairs of their StayHear+ ear tips in small, medium, and large sizes. The tips are designed with a soft conical shape to create a comfortable and secure fit that spreads evenly across your ear. In addition to being comfortable, they also isolate your listening environment, which further contributes to the overall noise reduction. Making sure to cover all the bases, Bose has also included an inline microphone and remote for making phone calls and controlling various functions. The QC20 (Android, BlackBerry, Windows) has a two-button remote that can be used to answer phone calls and toggle the Aware Mode on and off, while the QC20i (Apple iOS) has a four-button remote with all of the same features, plus it adds volume, music control, and voice commands. Besides the remote, both models have a 3.5 x 1.25” control module just above the output connector that has a slider switch for turning the noise-cancelling function on and off. Built inside the control module is a rechargeable, environmentally friendly lithium-ion battery that supplies the necessary power for the active noise cancelling. The battery, which charges fully in just two hours using the supplied USB cable, delivers up to 16 hours of noise cancelling per charge. Battery life is indicated by a status light located on the control module. If the battery does happen to die you can still listen to music, you just can’t use the noise-cancelling function. Both models also come with a clothing clip to keep the cable out of your way, and a carrying case for storage and transport. For more information, stop by the B&H SuperStore in New York, speak with a sales professional on the telephone at 1-800-606-6969 or contact us online via Live Chat. I understand the the QC20i are designed for Apple and the QC20 are designed for Android or rather, designed for everything else. Will the QC20i work any less well on an android phone? Will there be any less features than if using the QC20? I don't have an Apple device, so are there any possible benefits to me getting the QC20i? Do NOT purchase the QC20i if you do not intend on using them with an iPhone. There are no advatages they can offer you with other devices. Nor are an features lost. Hi! Can I use the qc20i headphones for Samsung? Thanks! The Bose QuietComfort 20 Acoustic Noise-Cancelling In-Ear Headphones (Black) will work with most Android based phones. The Bose QC 20i is designed for use with iOS devices/iPhones. I thought I purchased the android model, but when it arrived the box says for Windows and Blsckberry models. Will the call feature and everything work with Android phones anyway? 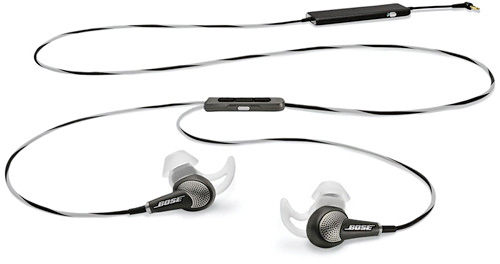 The Bose QuietComfort 20 Acoustic Noise-Cancelling In-Ear Headphones (Black) will work with most Android based phones. The diffrence between the QC20 and the QC20I is that the QC20 is a universal vanilla set of headphones. The QC20I have extra buttons that are made for Apple products. There's also a set SMSG which gives the features of the QC20I for Samsung and other Android devises. i have an ipad that listen to music and watch movies on. I have an android that i make phone calls with. if i buy the 20i for apple, will it work on my android phone for phone calls with a "set SMSG", whatever that is? They will work as headphones but some of the phone and music advance features may not work effectively or consistently. Why are there two different price points for the same model - is it a mistake or does the color make a difference? The 20 and 20i are different models but the available colors sometimes differ in price as well. The control module's longest dimension is 3.5" but the case's is only 2.75". How does it fit? Hi, thanks so much for pointing this out. The case dimensions have been corrected.